As you may recall, I posted about a new online budgeting tool that uses the envelope system. The envelope system, if you recall, is a cash-based budgeting system that consists of creating literal envelopes in which you place the cash you have budgeted for the month. That way, each time you pull out $10 for this or $5 for that, you will be able to see with depressing accuracy, just how much money is leaving your “bank.” The system is in stark contrast to the debit and credit card age where we merely pay for everything with “magic” money. Well, as I promised in that post I was going to take on the website’s product – MySpendingPlan – as an experiment. Here’s what has happened so far – just one week into the month. 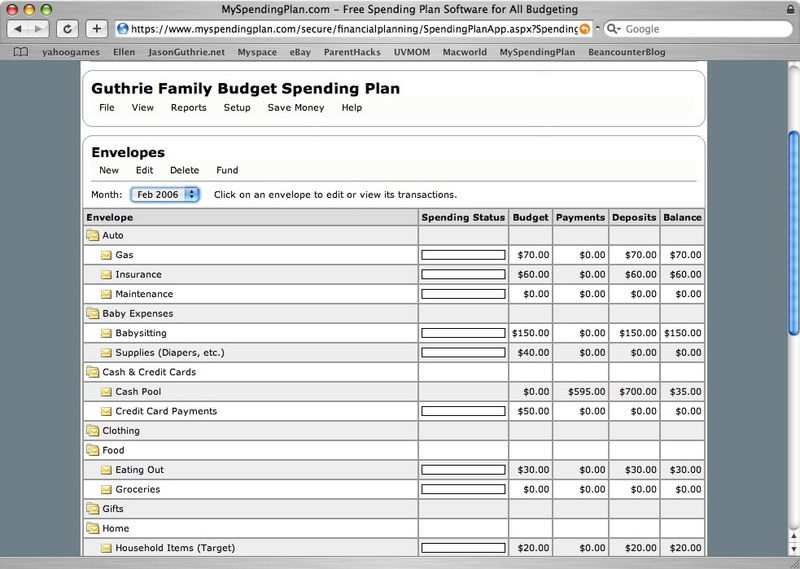 First of all I created an account at MySpendingPlan and began to create my own spending plan. The website provides a few templates to get you started so that you don’t have to create everything from scratch – so I chose one and went from there. However, I just mention that everything went downhill from there. The website is very clean and very good at keeping track of everything – but it is dang near impossible to use! The main page presents your virtual envelopes with the spending status, budget, payments, and deposits – along with your balance. If you want to adjust your budget, add payments, add deposits, or anything else – you must go to a different section. If you want to delete an envelope or just edit its name, you must also go to another screen. With the overwhelming presence of AJAX these days I’m surprised they didn’t allow this sort of editing on the same screen. So, after going to the “Edit Budget” page you are presented with a list of the envelopes, each with an “edit” button to the side. Again, if I want to edit a budget amount I must click on each individual “edit” button, edit the amount, and then click save. I think you are beginning to understand what I’m trying to get at here. All in all I would estimate that the entire process of creating the envelopes, adding funds, adding my budget, and adding bank accounts took me well over 3,000 clicks and about 1 1/2 hours. February Summary: this worksheet contained a nice looking presentation of the budget categories, the budget amounts, the payments, and the deposit amounts. The payment amounts came from a ‘countif’ statement that summed the transactions on the next worksheet. February Transactions: this worksheet contained the transactions for the month including the date, description, location, amount, and envelope name. The envelope name was restricted to a list generated from the first worksheet so that the ‘countif’ statement from the second worksheet would work correctly. I also tried MySpendingPlan after reading your first post on it. And I would have to agree with you about the user-friendliness. It took me about an hour just to set up my budget, then when I wanted to change something- I couldn’t even find a way to go back. Overall it was frustrating and I gave up. If the excel thing ends up working out, I’d be interested to see how you set up your excel tables.